Leftism is a substitute religion. The only thing it has in common with Christianity is the command to worship no strange gods. Leftism is what happens when a political ideology takes the place of God. No truce with it. I think it’s more accurate to say “Marxism ruins everything”. Marxism has this uncanny ability to transmogrifty itself, probably because it trade on a very old and perverse human vice, envy. It’s a truism that the rich and powerful prey on the poor and weak, and those fat cats have to be taken down, to help the “little guy”. Because they “care”, the teaching profession passes this on to their students (k-12 & college) so that they’ll “care” too. The class struggle becomes “the rich NRA only cares about gun sales” or “The fossil fuel industry pollutes the air brown people breathe”. I dunno. The French literally built altars to the goddesses liberty and reason around the same time they unleashed their anti-Catholic pogrom in the Vendee. Conservative principles are based on the Enlightenment, facts, history, reality. Leftist beliefs are based on cowardice, hatred, ideology, superstition. I thought conservative principles were based on natural law and revelation. ‘conservative principles’ are the concatenation of objections ordinary people have to the nexus of opinion peddled by the Anointed. I don’t think ‘Leftism’ is a substitute religion. It’s a discourse in support of self-aggrandizement by population subsets. Leftists sow chaos and confusion. We know who the father of chaos and confusion is don’t we. He confused Eve a long time ago making her think she and Adam were God. The Leftist or Progressive seeks to only knock down all fences rather than consider Chesterton had to say about Fences. But I think the biggest problem today is the Media, with the wind at their backs politicians lie and are not confronted with serious questioning. Most Journalists have become Prostitutes. Right now we have very little “Free” Press. Let’s hope that changes, for now -Thank God for the Internet. And that Thank God for Donald Trump, warts and all. I fully agree that Leftism is a secular religion, and that it seeks to displace traditional religion as a motivating force in the population. Atheism becomes an anti-constitutional state religion. There is nothing new under the sun, this was done before by Robespierre, Mussolini, Hitler, Stalin, Mao Zedong, (his successors are still at it) and it is a work in process on the present day American Left. I find myself rereading Jonah Goldberg’s “Liberal Fascism” after ten years of it resting in the back of my mind. If you have not read it, do so. 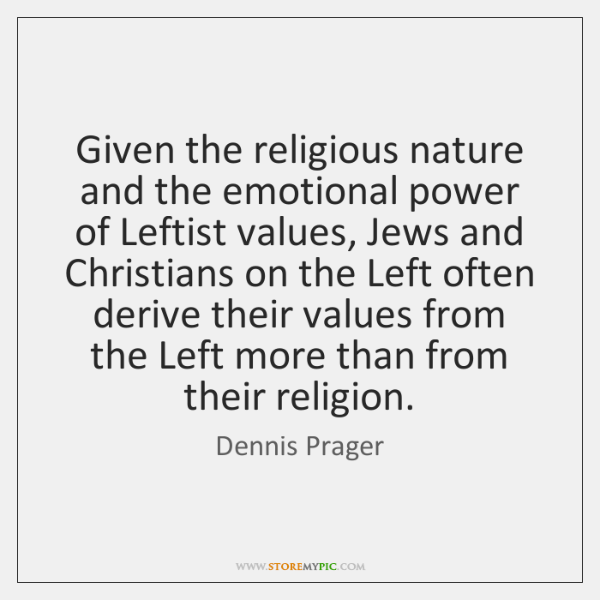 If you have, read it again. .
What Prager says in the above quote applies to practically all U.S. bishops, even those who are considered conservative and orthodox, like Chaput and Dolan et. al. Sadly, too many orthodox Catholics are too deep in denial to see the plain truth. Leftism elevates the State to the status of a god. It’s essential method of rule is the reduction of freedom as the state imposes uniformity and conformity. not a leftist because he strongly condemned New York’s newest pro-abortion law. I guess Chaput’s jumping into bed with notorious pro-aborts like Luis Gutierrez and Jared Polis don’t make him a leftist either. Yeah, the same Chaput that trashes Trump’s legimate immigration policy, repeatedly misrepresents Church teaching on capital punishment, even going so far as to clamuniating a Supreme Court justice, immigration need to be made of sterner stuff. Chaput also says critics of Fr. James Martin need to stop “trashing” him. Give it up, Don. Your defense of Chaput is beneath the dignity of even a defense attorney. Chaput may be working with Gutierrez and Polis but that doesn’t equate to being a leftist by any means. By your standard Roosevelt was a Soviet spy working for Stalin because they met at Yalta. Strange bedfellows are sometimes needed to eliminate a common enemy. “Archbishop Chaput insisted that the Catholic Church respects the law, including immigration law, and also respects those who enforce it. These do not seem like the words of an ‘open’ border leftist no matter how you slice it. The CCHD has had its problems and over the years have been accused of granting monies to agencies that are contrary to Catholic teachings. Actions have been taken to deal with these concerns and though they may still be given grants for immoral agendas it does NOT mean as it is said in the article that the whole program be scrapped completely because of that. Chaput: “If people don’t like the decisions of the Campaign staff and their allocations, one of the ways they can show their displeasure is by withholding funds from their diocesan collections,” the archbishop added. There, no strong arm tactics. You don’t want to give to CCHD find someplace else to contribute. We have a Pregnancy Center where I live and my parish regularly gives to them to help mothers and their babies. Should we stopped giving to the Center because some of the mothers committed fornication and had their babies out of wedlock? We, as Chaput have to weigh all sides, the good vs the bad when it comes to making a decision when a great many people will suffer for that decision. We do the best we can with the knowledge we have and with the God given strength that we have. It does not always suffice for the problem at hand. We have a major scandal in our Church so seeing scandals in the CCHD is not surprising nor does it make Chaput a leftist either. Let’s see. Jesus knew that Judas helped himself to the purse of the twelve yet still had him in charge of it…I wonder how Judas was dealt with by Jesus? First of all, it is not a bishop’s place to take sides on immigration policy. Secondly, seeing as how there are no shortages of republicans who advocate open borders and who are even pro-life at least on paper, Chaput could have at least picked better dance partners than Gutierrez and Polis. His choice of those two show where his priorities really lie. Except in matters where Catholic doctrine explicitly forbids it, Chaput comes out on the hard left on every issue. He has even demonstrates a willingness to misrepresent Church teaching towards that end. If that doesn’t make him a leftist, what does? Catholics, as with the abortion issue HAVE to take sides on immigration policy since it deals with the treatment of immigrants, refugees and the stranger. Chaput is not barred from expressing his beliefs on immigration because he is a Bishop. He is also a citizen of the country. Who Chaput picks in order to facilitate the Church’s teachings on immigration is his business if it helps him achieve the rightful end. His choices does not in the slightest show me where his priorities lie. But it does show me he will use the tools at hand in order to do his job. GM you seem to find the hard left in every little nook and cranny of Chaput. Sometimes when we look to hard for something whether it’s true or not, we find it anyway. What part of Catholic doctrine Greg mandates Chaput stating that Notre Dame should honor Trump? Calling Chaput a Leftist renders the term devoid of meaning. Stop banging the table Greg, that is what lawyers do when the facts and the law are against them. On issues like immigration, capital punishment, and gun control, Abp. Chaput comes out on the hard left. He has repeatedly shown he is not above demonizing people who take issue with him on these matters in a way that would Saul Alinsky proud, he also misrepresents Church teaching to advance that ideological narrative. I have provided clear factual evidence to support everyone of those claims and then some. How, precisely, is that pounding the table? If Chaput isn’t a hard leftist on these matters, then neither is Dolan, McElroy (he actually praised some of Trump’s pro-life efforts), or even Cupich for that matter. is a hard left position, I can’t begin to imagine what a soft left position would look like. Please, my friend, don’t go the full Shea! Like many of his brother bishops, Chaput talks out of both sides of his mouth. He claims to support the right of the government to enforce immigration laws, but demonizes even modest attempts to do just that. Just go look up what he says about Trump’s actions on immigration. Furthermore, he was a bishop member of that sham USCCB ad hoc committee for religious liberty that equated state immigration laws that are completely just with the Obama Contraception Mandate as violations of religious liberty.